Greetings! A little while back I was sent a lovely VoxBox by Influenster, and today I'll be reviewing what I was sent. I'll have links to where you can purchase each item underneath their pictures, as well as brief reviews for each item. This is how the VoxBox arrived. A nice pastel green color, perfect for the Spring Bling theme. Inside includes 5 items (select Influensters received a 6th item: a Softlips Cube). 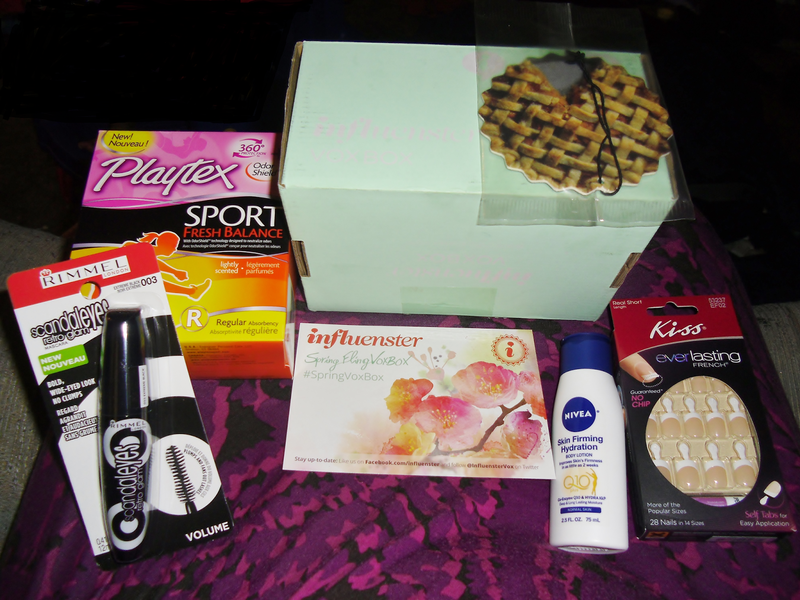 Included in my VoxBox was Rimmel London Scandaleyes Retro Glam Mascara, Kiss Everlasting French Nails, NIVEA Skin Firming Hydration Lotion, Playtex Sport Fresh Balance Tampons, and Peach Pie Car Freshener. Rimmel London Scandaleyes Retro Glam Mascara: $5.99 (buy HERE). "The 60s are back in full swing with a thicker, fuller, wide-eyed look! Rimmel London Scandaleyes Retro Glam Mascara brings you a bold, wide-eyed look, fanned out volume, and no clumps for lashes that are up, out, and over the top!" I received a regular, as in not waterproof, formula. I'm not used to a dry formula as I typically go for a wet lash look, but this looks great and it really lets you build up the intensity you desire. And I don't think I've EVER used non-waterproof mascara, but I was pleasantly surprised at how long lasting it was, and how easy it was to remove as well. I'm also not used to the wand; it's curved and pretty big compared to others I've used. I gravitate towards plastic combs, and this is a thick bristle comb with a curve directly in the middle. Aside from this being a completely different mascara than I'm used to using, it's surprisingly great. And has won beauty awards, with great reviews online. Kiss Everlasting French Nails: $6.49 (buy HERE). "The ultimate French manicure that never chips - guaranteed. Rich, white smile line looks like you just left the salon; file to any shape with no tip wear. Available in Flat and Regular nail arches with Flex-Fit Technology to ensure ultra-comfort and a perfect fit!" I have a great love for Kiss product and these nails do not disappoint. I love how they come in a short nail length as I can't be bothered by obnoxiously long nails. The color on the tips are guaranteed not to chip, and I promise they won't. The nail glue that is included is one of the best I've used and lasts a very long time. NIVEA Skin Firming Hydration Lotion: $2.49 for 2.5oz / $10.99 for 13.5oz (buy HERE). "Get your skin ready for warm weather with NIVEA Skin Firming Hydration Lotion. In as little as 2 weeks, you'll see firmer, more toned skin!" The formula of this lotion is more on the watery side of the spectrum, as I would not consider it "rich" or "thick". It absorbs into the skin after about a minute or so. Immediate results are having hydrated, soft, smooth skin. And you can feel your skin is tighter. The toned, firm skin will occur after about 2 weeks of use (at least in my case). This product is perfect for summer as it firms the skin and is a light weight lotion. Playtex Sport Fresh Balance: $3.99 - $4.99 (buy HERE). "Introducing NEW Playtex Sport Fresh Balance with Odor Shield technology. It's designed to neutralize odors for ultimate freshness on and off the field. Combined with a 360 design for Sport Level Protection, you can go the distance. Play On"
These little guys are great. They have a nice floral scent, but it's not too strong. And they are very comfortable to insert and wear. These are very high quality tampons, for a low cost. Peach Pie Car Freshener from the Labor Day Movie. "Kate Winslet & Josh Brolin star in Labor Day from Academy Award-nominated director Jason Reitman. Enjoy this sweet treat from Paramount Pictures in honor of the home entertainment release of Labor Day, available now on Blu-ray, DVD & Digital HD for $19.99"
Unfortunately I don't have a link to purchase this tasty smelling treat. It's a mouthwatering peach pie scented car freshener designed to go along with the steamy scene from Labor Day the movie. The only thing I didn't like about this car freshener was the size. It's quite large compared to the traditional little trees or pieces of fruit that I'm used to. Those are all the items received in my Spring Bling VoxBox. I quite enjoyed each and every item. And as always, I'm impressed with the generous sample sizes. Thank you to Influenster.